Baby wipes are a versatile essential that every parent should have ample stock of once baby arrives. Not only is a good wet wipe the easiest way to clean baby’s soiled bottom, but a wet wipe is the best travel addition to have handy when you have an infant. It can take care of surfaces when you want to put the baby down; it helps with spillages, food smudges on baby, and even to wipe your own hands down after everything is done! But parents have to worry about everything that touches the baby because of the probable chemical content in all of our products. We have to be sure about what a wipe contains and whether it is safe to use on our precious little champions. The slightest reaction from a product can set off an allergic reaction to the delicate skin of the young one. Here we have brought together a well-researched list of 8 best baby wipes available in the market. Read on to understand what will work for your angel and stock up on a good product for that delicate pink tushie. What could be better than water to clean a baby? Well, Waterwipes, that’s what! Waterwipes sensitive baby wipes are made of 99.9% purified water and a drop of fruit extract. These wipes are touted to be the purest baby wipe. Now, what more could you want from a wet wipe! The wipes are suitable for newborn infants. They are hypoallergenic baby wipes, and this quality makes them ideal for just born babies. They are also alcohol and fragrance-free. The packaging comes in 4 varieties of 196 counts, 240 counts, 540 counts and 720 counts. The wipes contain a drop of Grapefruit seed extract which is a natural skin conditioner and will help keep baby’s skin smooth and soft. No additives like phenols, phthalates or lanolin are added to the wipes. The wipes sometimes come out in clumps due to the absence of lubricant to help with dispensing the wipes. 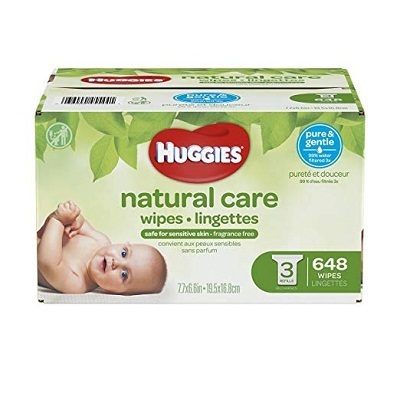 The Huggies Natural Care wipes are one of the best wipes for newborns as they are unscented and free of alcohol. Caress your baby’s skin as you clean off the soiled contents from baby’s bottom. Huggies wipes make the diapering job so much more acceptable and less cumbersome for parents. The wipes contain vitamin C and aloe which are natural skin moisturizers that will help hydrate baby’s delicate skin while wiping away the excrement and bacteria. They come in packs of 552 and 648 sheets. The wipes are pH balanced. They are easy to dispense even with one hand. The wipes are a tad harder to pull out of the soft packs as the number of sheets is reduced, but you can counter this by buying the Huggies tub and using the refill packs to stock your tub. Huggies wipes come in different packaging depending on your needs. You can choose from soft packs, refill packs, pop-up tubs, or clutch n clean dispensers. Organic baby wipes are finally a thing! Made entirely from natural ingredients, Babyganics wipes are free of chemical components that can be harmful to baby’s skin. Mothers who are very particular about the chemical composition of their baby’s products will be elated with this particular blend. It is an alchemy of nature’s own boutique brought into your homes by Babyganics. The wipes are made from plant extracts like chamomile, sunflower seed oil, and red raspberry seed oil. The wipes come in 5 packing variations that start at 200 and go up to 1800 sheets. The wipes are pediatrically tested and recommended by dermatologists and are the perfect sensitive skin baby wipes. Be sure to use before the expiry date as the natural oils can be affected and create mold if past the expiry date. 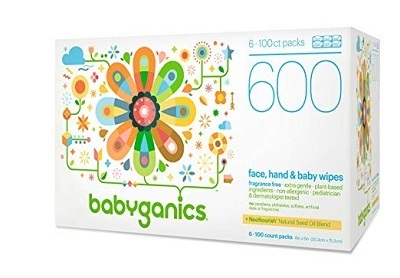 The Babygenic wipes are manufactured with cold compressed natural seed oil blends that make sure that your baby’s behind is taken care of just as well as the face. The bloom baby wipes are made from hypoallergenic, plant-based ingredients which are perfect for sensitive skin. As there is barely anything that is as sensitive as a baby’s derriere, this may be the ideal product to keep your little ones tush really cushy! Also, the manufacturing plant is a wind-powered plant, protecting the environment, one wipe at a time! The wipes come with plant-derived B-complex vitamins and other natural ingredients that nourish and hydrate your baby’s skin. The wipes are manufactured from Glacial Aquifer sourced from Long Island. This water is said to be one of the freshest sources of water to be found for manufacturing of a baby product. 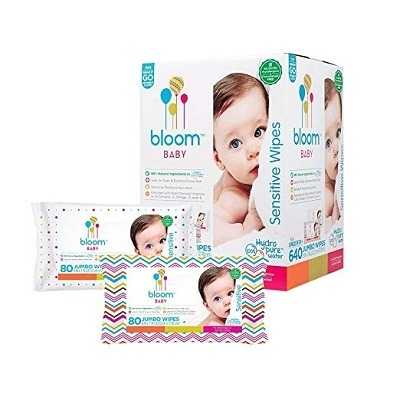 The Bloom wipes for babies are free of alcohol, fragrances, paraben, phenols, and other common allergens. It is a certified USDA Biobased product. It is suitable for use even on rash prone skin and eczema. The product is animal cruelty-free and has not been tested on animals. It is specially manufactured for use in the diaper area and strictly not for the face and eyes. Would you like a certificate for a free Baby Photo session with JC Penny Portrait studio? Well, that’s why you would love the Bloom baby wipes. They give you a certificate for a photo session with the purchase. What’s more, you get a free grab n’ go clutch for wipes with your purchase. What’s not to love, right? If you were worried about cleaning your baby’s bottom with chemical-ridden towelettes, wipe your brows because Pampers is here to the rescue. It boasts of 99% water and 1% cleansers and pH balances that are dermatologically tested. Chemical free baby wipes are every mother’s dream, and pampers are making these come true for you. Pampers wipes are made with the finest cotton that gives the softest touch during a cleanse. It contains no alcohol or fragrances that can be an irritant to sensitive skin. It comes in a pop-top packaging to make sure that moisture is retained until the last wipe. Free from skin irritants and allergens. The pop-top sometimes doesn’t latch properly, but it didn’t seem to affect the moisture content of the wipes. Pampers are the perfect wipes for diaper rash because of the hypoallergenic contents. You will enjoy how it makes cleaning easy without the worry of toxins and chemicals touching your child’s skin. When sensitivity is an issue, look no further for good baby wipes. 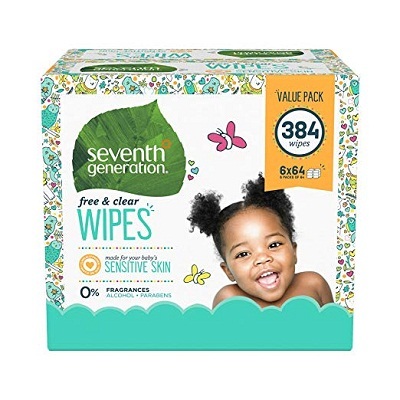 Seventh generation has soft, moist, and thick baby wipes. Parents who are concerned about the environmental impact of tissue and diaper waste can breathe a small sigh of relief because of the sheet size and thickness of each Seventh Generation wipe. The larger than average size of each wipe makes sure that there is ample utilization from every single wipe. The packaging comes in 3 sizes ranging from 384 counts to 768 counts. The wipes have 0% alcohol and parabens. Extra thickness which does affect the softness of the wipe. The wipes are a tad more expensive for a 384 count as compared to most other wipes. The Seventh Generation Free and Clear wipes are made from a sustainably sourced material that helps the planet while taking care of your baby. The aloe and vitamin E will revitalize your baby’s skin while cleansing. You get the comfort and strength of cloth, but the gentle caressing of a wipe with Free and Clear wipes. Move over regular wipes; designer wipes are here! 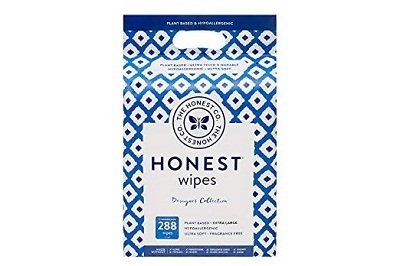 The Honest Company brings to you baby wipes that have style. They can be described as extra-large, ultra-soft, and plant-based wipes. The wipe come in Blue Ikat, Geo Shapes, and Rose Blossom patterns. Quite versatile and classy! The wipes are made with hygiene-grade material which is all plant-based. They are infused with botanical blends of masterwort leaf, pomegranate, cucumber, and chamomile, to deliver a pure and natural experience. The packaging comes in 2 sizes of 72 and 288 sheets. 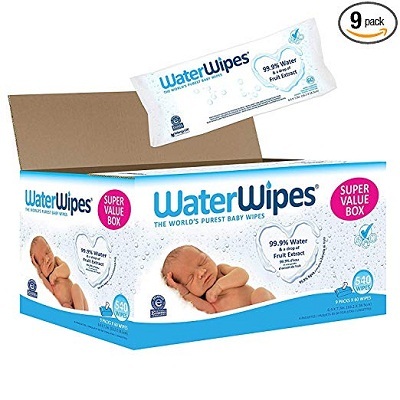 These wipes can be used to wipe anything from baby’s favorite toy to diaper changing stations to the usual soiled bottoms. The wipes are plant-based and easily biodegradable. Quilted and interlocked material helps to get any build-up of debris while cleaning. Fancy pricing for a fancy product, these wipes are a bit expensively priced in comparison with the market standards. The company boasts of quality which customers are raving about. The thickness and finish of the wipes ensure that they don’t rip while cleaning and they are gentle as a cotton quilt on your baby’s skin. You thought that baby wipes are only for cleaning soiled bottoms, didn’t you! We bring to you baby wipes that are made exclusively to clean snot and nose boogers. This wipe was created by an imaginative mother who went through tons of handkerchiefs, red and bruised noses, and boogie filled nostrils before she decided that saline wipes are better than saline water plus normal wipes. 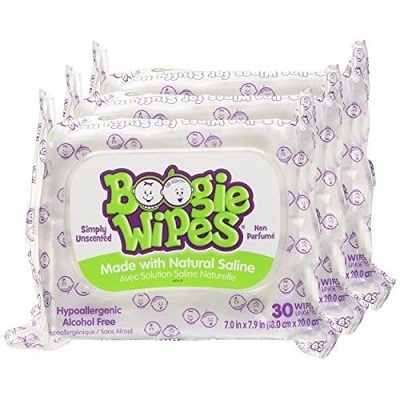 The Boogie wipes are made with a 0.9% saline that is isotonic. This helps to naturally decongest and remove snot that is piled up inside the nostrils. In addition, the wipes have chamomile, aloe, and vitamin E that make them ultra-soft. The wipes come in a resealable packaging to keep the wipes fresh and moist for use. The wipes are recommended by dermatologists. They are safe for use at all ages as they are free of allergens, parabens, and other chemicals. Encourages toddlers and babies to blow their own noses. Available in grape, fresh scented and unscented variants. These wipes cannot be used to clean the diaper region as they contain saline which can create sensitivity to the skin on the buttock. Boogie wipes are the answer to congested, dried up nostrils. The natural saline is the best way to deal with blocked noses, mucus, and symptoms of the flu. The wipes use spun lace technology that makes them soft to use on tender and sensitive skin too. We have brought you a list of wipes that can be used from the day your angel is born because you have so much to fuss over once baby comes; we thought that baby wipes should be one item taken off that list. So, take your pick from the listed baby wipes and check one item off your list of things to worry about when baby gets here. Happy diaper changing and happy parenting to you!